The certificate of deawth of Charles Crummer (1894-1934). 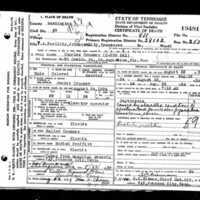 He died in a veterans' hospital in Johnson City, Tennessee. The record includes the facility's name, as well as Crummer's name, age, race, and time and cause of death. Charles Crummer was born on August 24, 1894 in Palatka, Florida to his parents Walter and Maria. He lived there with his parents and five brothers until sometime between 1900 and 1910, when the family moved to St. Augustine. After receiving an education that allowed him to read and write, Crummer worked as a chauffeur. On April 1, 1918, he was drafted for service, and served for a short time in the 151st Depot Brigade, a unit responsible for training and processing new recruits. He then became part of Company A of the 36th Infantry, which he served in from April 24, 1918 until his discharge on April 2, 1919. After being discharged, Crummer returned home to his mother and continued to work. Between 1920 and 1927, he and his new wife, Jennie, moved to their own house, where they lived together until Crummer was admitted to a veterans' sanitorium in Johnson City, Tennessee for chronic pulmonary issues and a spinal condition. He lived there until his death in 1934 due to complications with diabetes and septicemia. Crummer is buried in the St. Augustine National Cemetery at Plot A Grave 38. 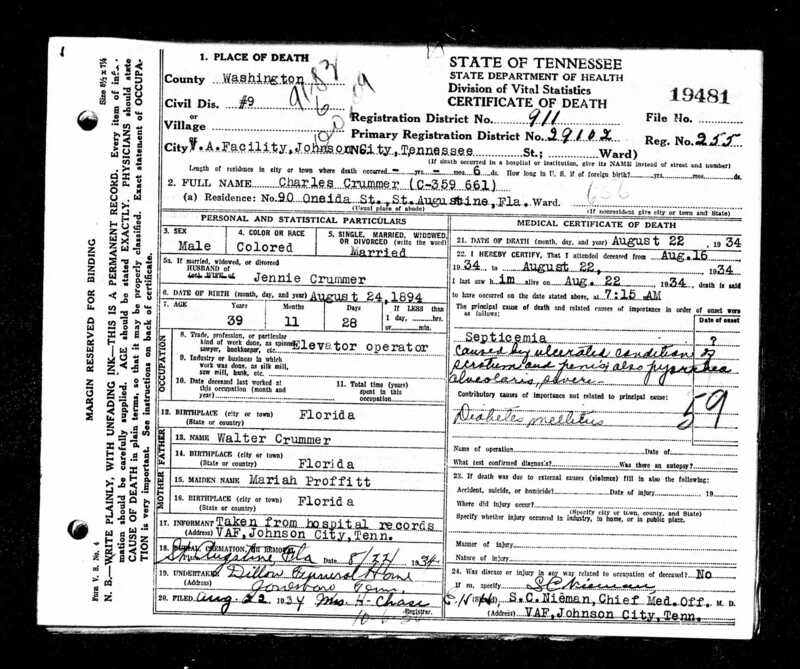 Digital reproduction of original certificate of death, August 22, 1934: Tennessee State Library and Archives, Tennessee Death Records, 1908-1958, Roll Number 8. Originally created and published by the State of Tennessee Department of Health. "36th Infantry." U.S. Army Center of Military History. Accessed July 26, 2018. https://history.army.mil/html/forcestruc/cbtchron/cc/036id.htm. Florida Department of Military Affairs. "Charles Crummer." Online database with images, FloridaMemory. St. Augustine, Florida. Box 4. Accessed July 26, 2018. https://www.floridamemory.com/items/show/206485. Keene, Jennifer. World War I: The American Soldier Experience. Lincoln [u.a. ]: University of Nebraska Press, 2011. Selective Service System. "Charles Walter Crummer." United States World War I Draft Registration Card, 1917-1918. Online database with images, FamilySearc. St. Johns County, Florida, United States. NARA microfilm publication M1509, FHL microfilm 1,556,926. Accessed July 26, 2018. https://www.familysearch.org/ark:/61903/1:1:K35-1R6. U.S. Census Bureau. "Charles Walter Crummer." United States Census, 1900. Online database with images, FamilySearch. Palatka City, Putnam, Florida, United States. NARA microfilm publication T623, FHL microfilm 1,240,176. Accessed July 26, 2018. https://www.familysearch.org/ark:/61903/1:1:M366-SYX. U.S. Veterans Affairs Office. "Charles Walter Crummer (1894-1934)." Online database with images, Find A Grave. Accessed July 26, 2018. https://www.findagrave.com/memorial/3963529/charles-walter-crummer. Nieman, S.C. and State of Tennessee Department of Health. “Certificate of Death for Charles Crummer, 1934.” RICHES of Central Florida accessed April 20, 2019, https://richesmi.cah.ucf.edu/omeka/items/show/10389.